The conventional magnetic memories of electronic devices store information by using the materials small magnetic domains by pointing up or down according to the magnetic fields. These magnetic fields are generated via electric currents. The problem is these electric currents create heat, which the system must then exert energy to cool them. Roughly 40% of the electrical energy exerted by computers is dissipated as heat. That is why researcher at the University of Barcelona created a nanoporous copper and nickel based alloy that allows the handling and storing of information using very little energy. The research team led by Jordi Sort featured his innovative new material in the Advanced Functional Materials journal. This specific nickel and copper alloy has a structure similar to that of a sponge with pores measuring the size of a millionth of a millimeter, this allows for less energy to be used during the storage and handling of information on electronic devices. This new material could be the base for the new magnetic memory systems in computers and mobile phones, giving them greater energy efficiency and longer battery life. 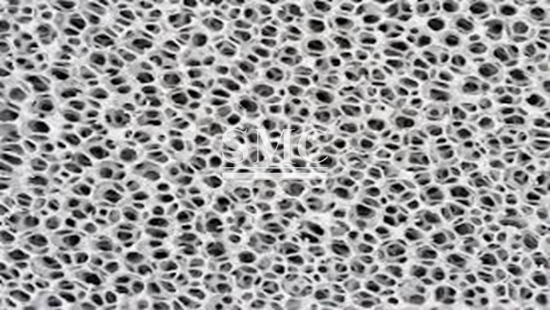 The organization of the copper and nickel alloy films is done in a way that the interior forms surfaces and holes in a similar way as a sponge. The separation between the pores is only five to ten nanometers, so the walls of the pores contain enough room for only a few dozen atoms. Jordi explains how the structure works to provide efficient electromagnetism stating, “The nanopores found on the inside of nanoporous materials offer a great amount of surface. With this vast surface concentrated in a very small space we can apply the voltage of a battery and enormously reduce the energy needed to orientate the magnetic domains and record data. This represents a new paradigm in the energy saving of computers and in computing and handling magnetic data in general”. Upon testing of this material the researchers found that this resulted in a 35% reduction of magnetic coercivity, which is a magnitude related the energy consumption. These first prototypes were created using liquid electrolyte voltage as an energy source, but in order for this technology to be applied and used in devices in the market a solid material will need to be used. Once this is attained direct energy savings in computers and mobile devices can be attained resulting in longer battery life, less energy consumption, and longer device life. This is not only convenient for consumers everywhere, but it will also have a positive effect on the environment.